With Ultra HD, normally known as 4K labeled everywhere on TV shelves, people are jumping on the bandwagon to see what the future of next video standard looks like. However, according to the feedbacks from various forums, it's not easy to play HEVC h.265 files. ★ Though iOS 11 gives iDevices the ability to play standard 1080P HEVC files, it requires A9 clip or newer (iPhone 6S and up, iPad Pros and 2017 iPad) or Intel chips in 2017 Macs and up to play 4K HEVC H.265 videos without buffering. ★ VLC has added the support for 4K (HEVC/H.265) videos, but still, there are users getting troubles like "no audio, no video is showing, just getting a black screen", "can't play hevc videos in VLC properly". ★ "I have an older laptop but I can play x264 with no problem cpu only at about 40%...when I try to play hevc x265 the video gets all pixalated and the cpu spikes to 100 sometimes freezing." Now come to the point, we will need a free HEVC player to play H.265 4K videos smoothly. Therefore, we pick the best free HEVC video players that support 4K HEVC H.265 playback on Mac, PC, Android and iDevices. Get the best H.265 hevc video player free download and enjoy. 3. 100% Safe and FREE video player for 4K HEVC H.265 files. 4. Light weight and less CPU usage for UHD 4K HEVC files. This HEVC player is nothing short of amazing. It's one of the very best free media players I have ever used. The interface is sleek and the performance is top-notch. Most importantly, this player has no problem to support 4K HEVC H.265 files. As advertised by the company, it indeed plays 4K HEVC, HD 1080p, 360 VR, 720p mkv, mp4, mts, mov, avi, dvd and any videos I throw to it. I am really impressed by the smoothness and clarity when i play HEVC videos in 4K resolution. The choppy playback & heavy CPU usage with other free HEVC players is never a problem. Plus, there are many bonus and novel features to explore with the free hevc h.265 player, like Airplay HEVC 4K to TV or iPhone iPad, and download hevc videos. So I will recommend 5KPlayer as the best free HEVC video player for H.265 4K UHD videos. DivX has everything you need to watch DivX, MKV and HEVC up to 4K films, including an option for HEVC video player free download. Divx Player also has a modern look with a black and gray design. To play a HEVC (H.265) file, you will need to free download DivX Player 10 and later versions. Its official site claims it as the first 4K free HEVC media player that includes the 4K HEVC playback ability. Admittedly, I can easily play HEVC files on the player with no problem. There are some users saying that they fail to play long-length 4K HEVC videos with DivX Player, but no such errors occur in my experience. If any playback issues come up, you can always choose another good free media player that supports 4K HEVC H.265 from this list. Similar to VLC, KMPlayer covers various formats such as HEVC H.265, VCD, DVD, AVI, MKV, Ogg Theora, OGM, 3GP, MPEG-1/2/4, WMV, RealMedia, and QuickTime. If you don't want to install HEVC codecs, or have a low CPU computer, KMPlayer is a good free player for HEVC files. You can play 4K uhd HEVC files on computer or mobiles without worrying about slowing down the device. The best part of this free HEVC video player is that it not only works with local 4k HEVC(h.265) files, but also online hevc streaming via a url, or all kinds of external digital TV systems. Though iOS 11 bring HEVC playback to iPhone and iPad, many Android video players are out of luck. If you're looking for the best free HEVC player for Android or iOS mobiles, then MX Player is here. By taking advantage of the hardware acceleration and multi-core decoding, this free hevc media player can easily play 4K HEVC video as well as other HD files. There are some complains about lag during HEVC H.265/MKV playback. The fix is simple: reset the core or switch from HW decoder to SW decoder. However, I notice a faster battery drain after the move. Anyway, you can feel free to get the 4k h.265 hevc video player free download on Samsung, Huawei, Xiaomi, LG, HTC, all other Android phones and tablets now, it's 100% safe and free. If you already have a player and don't want to install any other of those free hevc h.265 media players listed above, there is another option: convert HEVC videos to the format/device you need without quality loss. 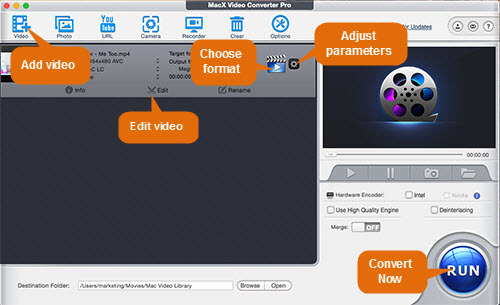 I understand that the most important factors for a HEVC video converter involve video quality and file size, I recommend MacX Video Converter Pro. 1. Convert HEVC H.265 into H.264, MKV, MP4, MOV, AVI, FLV, etc or iPhone X/8/7, iPad, Samsung Galaxy S8/Note 8, Huawei Mate 10, and more. 2. Convert 4K UHD, HD 1080p, 720P, SD videos without affecting the quality. 3. Compress the large-size 4K UHD/HD videos into 40% to 70% smaller size for mobiles, without noticeable quality loss. 4. Free download 4k HEVC videos, HD mkv videos, VR 360, Bluray videos in any format from YouTube, FaceBook, Vimeo, 300 more sites. 5. Advanced Intel QSV hardware acceleration tech and multi-core CPU (up to 8) support ensure the World's NO.1 fast speed for download & convert HEVC content. Step 2: Then click "Add File" button to load HEVC videos and choose an output format from the popup window. 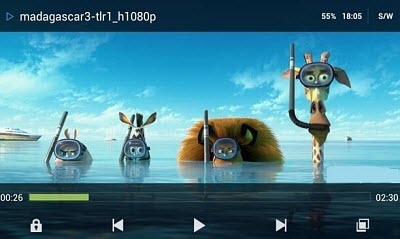 To play HEVC videos on Android iOS devices, you can select a compatible video format for you device like MP4, AVI, MOV etc or just select the device directly in the device profile list. Step 3: Click "Browse" button to select a destination folder and click OK. Check the Intel box to ensure a faster 4k video conversion. Step 4: Click "RUN" button to start converting HEVC videos. Then you can play 4k HEVC H.265 videos on Android Samsung, HTC, LG, Google or iOS devices without any free hevc video players. To download HEVC content, check how to download HEVC h.265 movies. 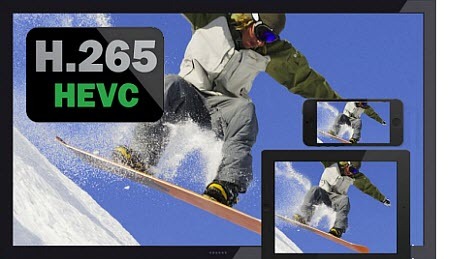 MacX Video Converter Pro will convert HEVC H.265 4K/HD videos to mp4, avi, mov, mkv, h264 etc for iPhone, iPad, Android. It will also free download HEVC 4k videos from YouTube, FaceBook, Vimeo, and 300 more sites with fast spleed.